Up for sale is a copy of Doom 64 for the Nintendo 64 complete with box, manual and inserts. Turok 2 Seeds of Evil for Nintendo 64. Nintendo 64. Nintendo DS. Nintendo NES. Super Nintendo. If you are not happy with it we will work to fix the problem. Just let us know. They arenot included in the listed price. See pics for condition. Has been tested and works as it should. It's in Fair Condition and has been used. 5 out of 5 stars - Turok Dinosaur Hunter Nintendo 64 N64 OEM Video Game Cart Authentic Retro GREAT! 88 product ratings88 product ratings - Turok Dinosaur Hunter Nintendo 64 N64 OEM Video Game Cart Authentic Retro GREAT! South Park Nintendo 64 N64 Authentic OEM Video Game Cart Shooter Mature GOOD! No fake labels. Genuine Nintendo boards. USA-CAN FORMAT! 4.5 out of 5 stars - South Park Nintendo 64 N64 Authentic OEM Video Game Cart Shooter Mature GOOD! 82 product ratings82 product ratings - South Park Nintendo 64 N64 Authentic OEM Video Game Cart Shooter Mature GOOD! New ListingN64 Turok: Rage Wars (Nintendo 64, 1999) Great Game to Have L@@K!! Item is not mint!You may find minor scratches and scuffs. 4 out of 5 stars - N64 Turok: Rage Wars (Nintendo 64, 1999) Great Game to Have L@@K!! 13 product ratings13 product ratings - N64 Turok: Rage Wars (Nintendo 64, 1999) Great Game to Have L@@K!! South Park for Nintendo 64. Nintendo 64. Nintendo DS. Nintendo NES. Super Nintendo. If you are not happy with it we will work to fix the problem. Just let us know. No Case or Instructions. Original Box - Authentic ! Nothing else included. Not a reprint! Goldeneye 007. Mortal Kombat Trilogy. Killer Instinct Gold. Nintendo 64 Lot. See photos. unaware of. the item you will receive. battery does not work at all, the item will be listed as "dead battery.”. Mortal Kombat 4 (Nintendo 64, 1998) complete with box and instructions. Condition is Very Good. Shipped with USPS Media Mail. 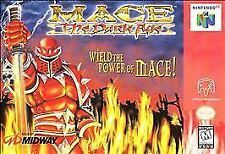 Mace Dark Age for Nintendo 64. Nintendo 64. Nintendo DS. Nintendo NES. THE PHOTO SHOWN IS AN EXAMPLE. YOUR ITEM WILL BE SIMILAR BUT MIGHT NOT MATCH EXACTLY. Super Nintendo. If you are not happy with it we will work to fix the problem. Trending at $11.83eBay determines this price through a machine learned model of the product's sale prices within the last 90 days. Nightmare Creatures Nintendo 64 N64 Complete in Box CIB with instruction manual. Condition is Acceptable. Shipped with USPS First Class Package. 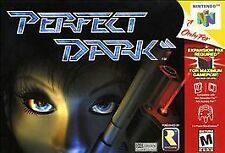 Perfect Dark Nintendo 64 Cartridge Only. Condition is Very Good. Shipped with USPS First Class Package. Doom 64 (Nintendo 64, 1997) game only. Condition is Very Good. Shipped with USPS First Class Package. New ListingNIGHTMARE CREATURES AUTHENTIC NINTENDO 64 GAME, 1998, N64 CLEANED AND TESTED. 5 out of 5 stars - NIGHTMARE CREATURES AUTHENTIC NINTENDO 64 GAME, 1998, N64 CLEANED AND TESTED. 18 product ratings18 product ratings - NIGHTMARE CREATURES AUTHENTIC NINTENDO 64 GAME, 1998, N64 CLEANED AND TESTED. A loose copy of Mortal Kombat Trilogy for the Nintendo 64. South Park (Nintendo 64, 1998) N64 COMPLETE w/ Box manual game WORKS! 4.5 out of 5 stars - South Park (Nintendo 64, 1998) N64 COMPLETE w/ Box manual game WORKS! 82 product ratings82 product ratings - South Park (Nintendo 64, 1998) N64 COMPLETE w/ Box manual game WORKS! Complete, but no white cardboard retainer. Quake II (Nintendo 64, 1999) N64 Complete. Condition is Good. Shipped with USPS First Class Package. Resident Evil 2 (Nintendo 64, 1999) MIB Factory Sealed . Condition is Brand New. Shipped with USPS Priority Mail. Hello ebayers! Up for sale is the following N64 game. The game is complete with box, manual and game. ALL OF MY PRODUCTS ARE 100% AUTHENTIC SO PLEASE DONT BE WORRIED ABOUT REPRODUCTIONS. Exactly what you see is exactly what you get so please buy and bid with complete confidence! I did my best to show you every angle of the box possible if you would like any other pictures please message me and I will get them to you as soon as possible. Thank you very much for looking! New ListingHEXEN AUTHENTIC NINTENDO 64 GAME, 1997, N64 CARTRIDGE, CLEANED AND FULLY TESTED. 4.5 out of 5 stars - HEXEN AUTHENTIC NINTENDO 64 GAME, 1997, N64 CARTRIDGE, CLEANED AND FULLY TESTED. 22 product ratings22 product ratings - HEXEN AUTHENTIC NINTENDO 64 GAME, 1997, N64 CARTRIDGE, CLEANED AND FULLY TESTED. Quake Nintendo 64 N64 Authentic OEM Video Game Cart Shooter Mature SUPER FAST! NTSC-USA/CAN Format! Will be in OKAY physical condition, but will work just like it should. 4.5 out of 5 stars - Quake Nintendo 64 N64 Authentic OEM Video Game Cart Shooter Mature SUPER FAST! 25 product ratings25 product ratings - Quake Nintendo 64 N64 Authentic OEM Video Game Cart Shooter Mature SUPER FAST! Perfect Dark and JetForce Gemini Nintendo 64 Games. Condition is Very Good. Shipped with USPS First Class Package. Two game bundle..
New ListingPERFECT DARK AUTHENTIC NINTENDO 64 2000 GAME WITH MANUAL N64 TESTED AND CLEANED. 4.5 out of 5 stars - PERFECT DARK AUTHENTIC NINTENDO 64 2000 GAME WITH MANUAL N64 TESTED AND CLEANED. 208 product ratings208 product ratings - PERFECT DARK AUTHENTIC NINTENDO 64 2000 GAME WITH MANUAL N64 TESTED AND CLEANED. Conker's Bad Fur Day (Nintendo 64). Condition is Like New. Shipped with USPS First Class Package. The box is in very good condition with minor wear (although a white cardboard flap inside the box had been detached, see pic), and the instructions and paperwork are in excellent condition with only minimal wear. Trending at $54.33eBay determines this price through a machine learned model of the product's sale prices within the last 90 days. Turok Rage Wars Gray for Nintendo 64, cart only. Cart is in good shape, has some scratches and signs of wear. Label is good, has wear at the top/middle, scratches, and a circular indent in the middle of label. Pins have been properly cleaned and game is tested and working. Protective case included as shown. See pictures for details. U.S. Only. 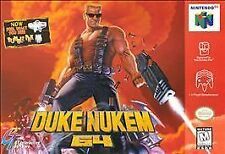 Up for sale is Duke Nukem 64 CIB for the N64! System flushed without any records, great gift for kids with affordable price. Limited Amounts available. NIGHTMARE CREATURES AUTHENTIC NINTENDO 64 GAME, 1998, N64 CLEANED AND TESTED. HEXEN AUTHENTIC NINTENDO 64 GAME, 1997, N64 CARTRIDGE, CLEANED AND FULLY TESTED. PERFECT DARK AUTHENTIC NINTENDO 64 2000 GAME WITH MANUAL N64 TESTED AND CLEANED. What M Rated Games Are Available For the Nintendo 64? The Nintendo 64 is a video game console released in 1996. N64 games offer a wide range of video games for all ages, including mature games aimed at an older audience, and with a number of different genres. What Genres of Games Are There? Genres covered are fairly extensive for mature-rated console games, so there's always something to play. Action Platformer: These games often have a third-person perspective, and focus on running and jumping through a large world to access new areas and defeat enemies. 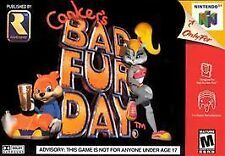 An example of a mature game in this genre is Conker's Bad Fur Day. Conker the squirrel must face off against villains such as the Panther King, Count Batula, and Don Weaso and his Weasel Guard. First-Person Shooter: Players see from the character's viewpoint, and must navigate levels and defeat enemies. Many different FPS games for the N64 have a mature rating. Two examples are Duke Nukem 64, which is a part of the popular Duke Nukem game on PC, and Turok 2. Duke Nukem is quite similar to Doom, the quintessential FPS, but differs in that the main character actually speaks. Turok is a sci-fi game about the titular dinosaur hunter and his adventures through time and space. Fighting Games: Fighting games are often co-op, although most have single-player modes as well. Players control one of two fighters, who do battle with a variety of combo moves. A well-known example of the fighting game genre is Mortal Kombat. 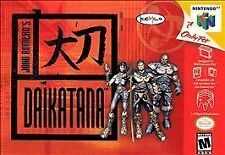 The Mortal Kombat games have long been synonymous with violence, and Kombat 4 for the N64 was no exception. These games are based around the eponymous tournament, where the losers are regularly subjected to fatalities, finishing moves of great brutality that are shown with cinematic glee. Action Adventure: This genre is less focused on jumping and movement than platformers, and less focused on action than FPS games. Instead, story and exploration are the key points. A great example of this genre is Eternal Darkness. The protagonist must unlock ancient and terrible secrets in order to stop one of three Elder Gods from emerging into our world. Other examples include Metroid Prime and Shadow Man. Survival Horror: This genre is similar to FPS or adventure games, but the primary gameplay difference is that the player must be extremely careful, as ammunition and health pickups are scarce, and monsters, while less common, are more dangerous. The definitive survival horror series is Resident Evil. 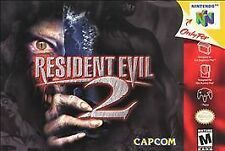 Resident Evil 2 is available for the N64 and is based in Raccoon City, which has been overwhelmed by a zombie virus. Players must fight against the hordes of mutants and zombies to survive and discover what is going on in the city. The horror imagery and intense survival atmosphere is what earns this game an M rating.